I’ve been part of the strange tribe of runners for over 35 years and had a few beers along the way. Beer is a subject rich with culture, economics, science and history in addition to being mighty tasty. Sometimes I dive into those subjects. Other times, I just ramble on about beers or breweries I like. And like all runners, I can’t help talking about my running from time to time. When I’m not drinking beer or running, I’m a Silicon Valley tech geek prone to over analyzing things. Do you have what it takes to be the Steven Speilberg of Craft Beer? Or perhaps Craft Beer’s Ed Wood? Here’s your chance to prove it. Jeff Moses, who runs The Monterey Beer Festival announces the debut of the Short Pour Film Fest at the 2010 Monterey Beer Festival. It’s the first ever short-film festival on the subject of BEER and will take place at the Monterey Beer Festival on June 5th, 2010, from 12:30pm to 5pm. The film line-up for the Short Pour Film Fest will include Live Action Short Films, Animation Short Films, Music Videos and Commercials by established and emerging talent from around the world. All entries are on the subject of BEER and will run 3 minutes in length (or less). It takes place during the Monterey Beer Festival at the Monterey Fairgrounds, 2004 Fairgrounds Road, Monterey, California, 93940 and will be free of charge to Monterey Beer Festival attendees. Short Pour Film Fest honors both individuals who have achieved excellence in short film making and amateur filmmakers. This unique short-film festival showcases film making talent on the subject of BEER. Films will be shown in the historic King City Room, a 10,000 square foot building at the Monterey Fairgrounds (home to both The Monterey Jazz Festival and The Monterey Blues Festival). For Submissions of Films, please go to the website for rules, entry and release forms. You can also contact Jeff Moses of MBF Company at 1-831-521-7921, jeffmoses(at)nightthatneverends(dot)com. 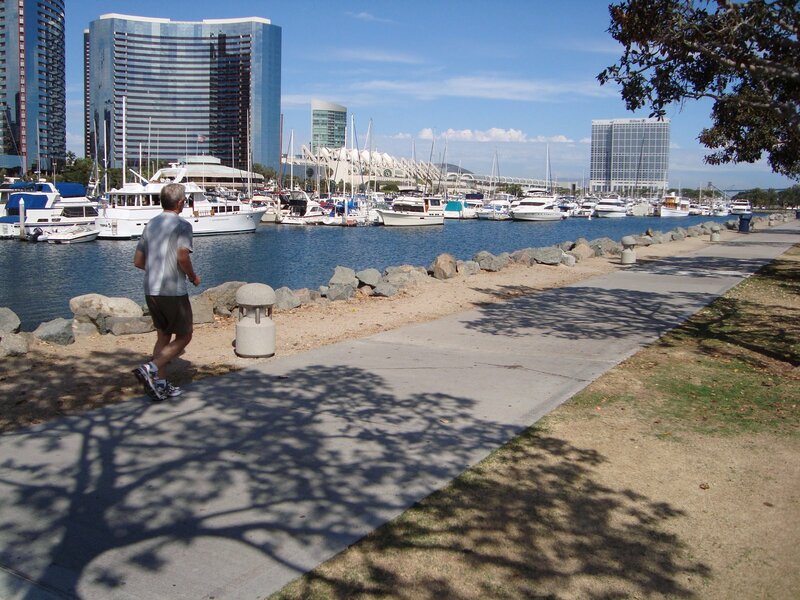 The Bayshore Trail in downtown San Diego is one of my favorite places to run in America. Like Central Park in New York, Chicago’s Lakefront, or the Embarcadero in San Francisco, it’s where runners find rare long stretches to run, uninterrupted by auto or foot traffic as the would find in most parts of the city. Like most popular running trails, it’s character changes over the course of the day. In the morning, it’s full of runners and a few bikers getting in their morning workouts. As the morning evolves into the day vacationers and sightseers start taking over. 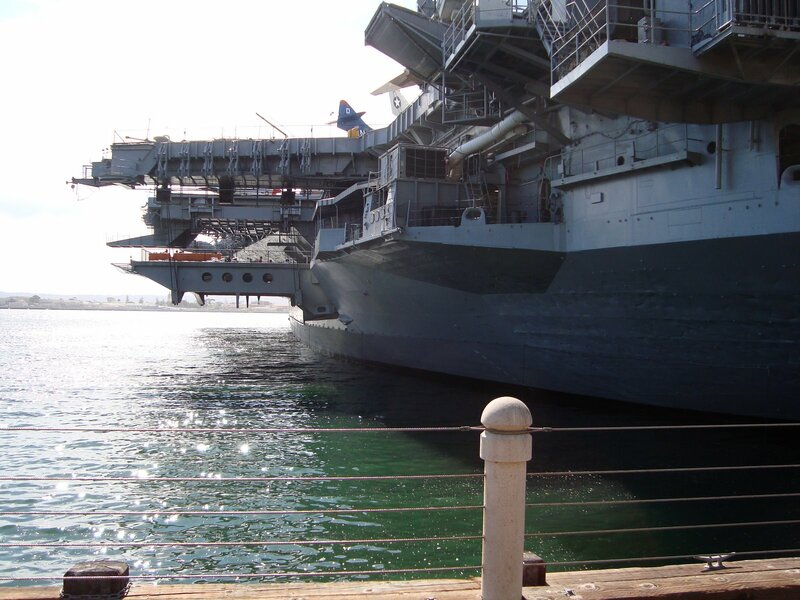 All the great views of the city, San Diego Bay, and the various ships of all shapes and sizes docked along the trail make for a run that’s a great way to start the day. Back in my beer swilling college days, I had some grasp of the concept of beer and desserts. One evening after knocking back a few cans of Busch beer, I filled a plastic tumbler with a couple more cans of the stuff, and then plopped in a couple scoops of mint chocolate chip ice cream. After showing everyone on my dorm floor this beer float, and taking a few chugs on a couple dares, somehow, this dreadful concoction ended up in an out of the way corner of my dorm room, and was forgotten. When I discovered it a few days later, some sort of mold was growing in it, the ice cream had morphed into sort some of crust, and the whole thing smelled rather nasty. Since my roommate was also a runner, funky smells in our living space were rather common, a likely explanation for why it went undetected for so long. Twenty some odd years later, the death of my grandmother in early 2007 provided an unlikely catalyst for new experimentation with desserts. After she was buried in Springfield, Illinois, her church provided a potluck lunch for family and friends of the departed, which included a few jello salads. At this difficult time, we all expressed our surprise that this traditional Midwestern comfort food seemed to be, well, quite comforting. We couldn’t quite understand why this culinary relic of the 50’s, with strange combinations like grated carrots mixed into orange jello had this effect on us. Perhaps, like any good comfort food it brought us to a simpler time of our youth. After the service, Dad brought us to his mother’s apartment, and asked my sister, Leigh, and I to take one thing back home with us. I took Grandma’s Harry Cary beer coaster. Leigh took Grandma’s recipe box sitting on the kitchen counter, with several jello salad recipes inside. My sister mailed me photo copies of all the recipes, and Grandma’s Cherry Cola Jello Salad has become a popular dessert I’ve brought to many gatherings. Seeing my interest in jello molds, a couple friends of mine gave me a brain shaped gelatin mold as a birthday gift, inspiring me to create a couple original deserts. First, I developed a Red Hot Russian Gelatin Brain, made with vodka and flavored with cayenne and cinnamon. And I put together a kid-friendly Blue Hawaii Jello Brain, using a package of Blueberry Jello, some crushed pineapple, and then my kids garnish it with gummy sharks. So with this session topic, I decided to find the old brain gelatin mold and work up a new creation. I decided to use Lindemans’ Raspberry Lambic for this mold, thinking its sweet, fruity, and tart flavor combination would work well in gelatin. I experimented twice with the recipe and technique, and settled on a formula which uses a 750 ml bottle of Lindemans’ Raspberry Lambic, which is about three cups of liquid, and 1/4 cup of water. The Knox gelatin powder directions call for one packet of powder per cup of liquid, but I found this made the mold a little stiff, so I used approximately 2 1/2 packets of powder for the 3 cups of liquid. I heated the 1/4 of water in a sauce pan and dissolved as much of the Knox gelatin as I could into it, about 2 packets worth. The idea here is avoid exposure of the lambic to the heat, which I feared could change its flavor. I had to pour in about a half cup of the lambic to dissolve the remaining powder, and then added the rest of the lambic in, slowly stirring it evenly distribute the gelatin, and then transferred it into the brain mold. The lambic foamed up a bit, so I let the foam subside before putting it into the refrigerator to set. 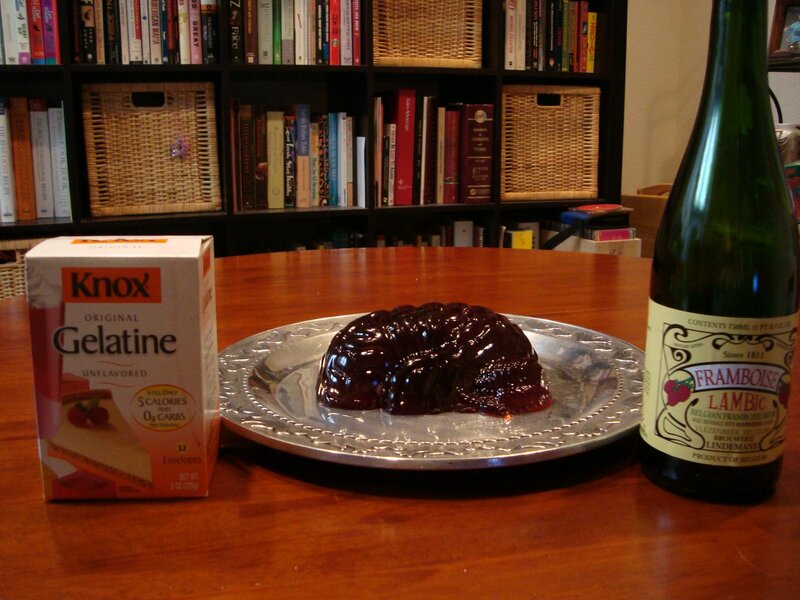 As for the taste, I found this technique did a good job preserving the lambic flavor in the gelatin. On the first try, I used a full cup of water and three cups of the lambic to dissolve four packets of gelatin, but I found this created a very stiff mold, that had a bit of a “washed out” flavor. Both times, I noticed the lambic gelatin picked up a slightly earthy bitterness, but the second run with less water, this bitterness was a lot less pronounced, and the lambic kept more of its tart, acidic character. Actually, I might add a little lemon juice on the third go around to replace some of lost acidity. I could also cut back on the gelatin powder a bit more. Of course, since the carbonation and liquid sensation on the tongue is totally lost when the lambic is made into gelatin, the mouth feel and overall taste is unavoidably modified. I found it very instructive to drink the lambic while sampling the lambic gelatin to best understand how this process transforms the overall flavor and sensation of the lambic. I think the final result makes a decent dessert, although I’d recommend adding something like whipped cream, or some sort of chocolate sauce or ice cream, to give the dessert a little depth and contrast. Some sort of mint infusion into the lambic gelatin might also work. Another beer I thought about using for a gelatin mold was a sweet barleywine like Lagunitas Brown Shugga. Any ideas for beers that might work well in a gelatin mold? 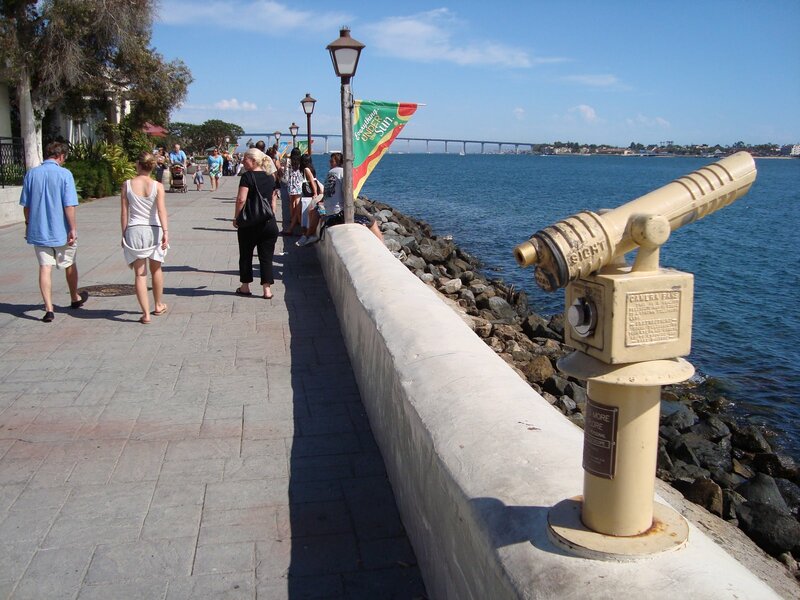 Next week, I’ll be travelling on business to San Diego. I’ll be staying downtown without a car, so won’t have an opportunity to visit the many great San Diego area breweries, but I will have an opportunity to sample some of the local beers. And running along the inner harbor trail is some of the best urban running in America. Turns out, the Imperial Stout is very much the yang of the West Coast IPA yin. Lot’s of rich, creamy, bitter coffee tasting malt in this bad boy, with the barest touch of any sweetness, and a little bitter chocolate character to it. The alcohol is really well hidden in this one. And as you can see, it pours a very thick, foamy head. Not really the beer to have during the afternoon at a San Diego beach during low tide, but works for me as an excellent late night sipping beer. 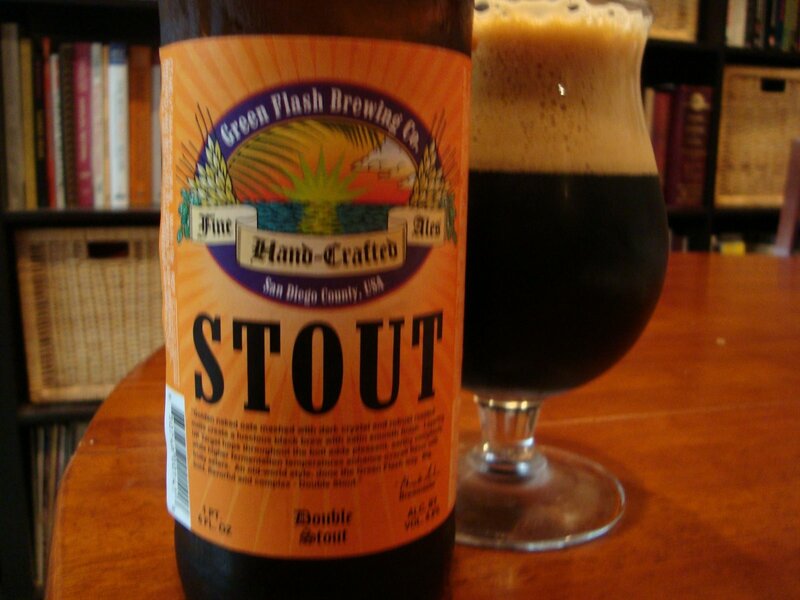 Hmmm…..what if you mixed Green Flash’s highly bitter, malt forward Double Stout with their West Coast IPA? Maybe I shouldn’t ask. A dismissive “Pfiff” is often the reaction to Italian beer. But thanks to Rob Denunzio over at Pfiff! , we have a chance to sample some of what the new craft beer scene in Italy has to offer. It’s The Second Annual Pfiff! Beer and Food Tasting – The Italian Modernists being held August 15th. It looks quite interesting, but unfortunately, I won’t be able to make it. So I’m trying to drum up some support for it with my readers. Both of you. I’m not optimistic my sister will make it all the way from Kansas City. So that leaves my co-worker Mary, if she’s still reading, who lives in San Jose. Think about it Mary, good Italian food, new and original Italian craft beer, and you never know, you might even meet a modern Italian. I must admit to being a bit of a tourist whenever I go up to San Francisco, having moved to San Jose from Detroit nine years ago. Linda and I try to take a day off from work once a month for a little exploring, and often we spend it in San Francisco. We’ve been talking about going to the Haight–Asbury neighborhood for sometime now, and yesterday we finally went. I had never been there, and was eager to see the neighborhood, a focal point of the 60’s counter-culture revolution, that gave the world Janis Joplin’s powerful soul, as well as The Grateful Dead’s tedious banality. As I suspected, Haight–Asbury is a good place to buy stuff like Tibetan crafts, Buddha statues, Jerry Garcia t-shirts, and ornate glass bongs. But I wasn’t there for that. 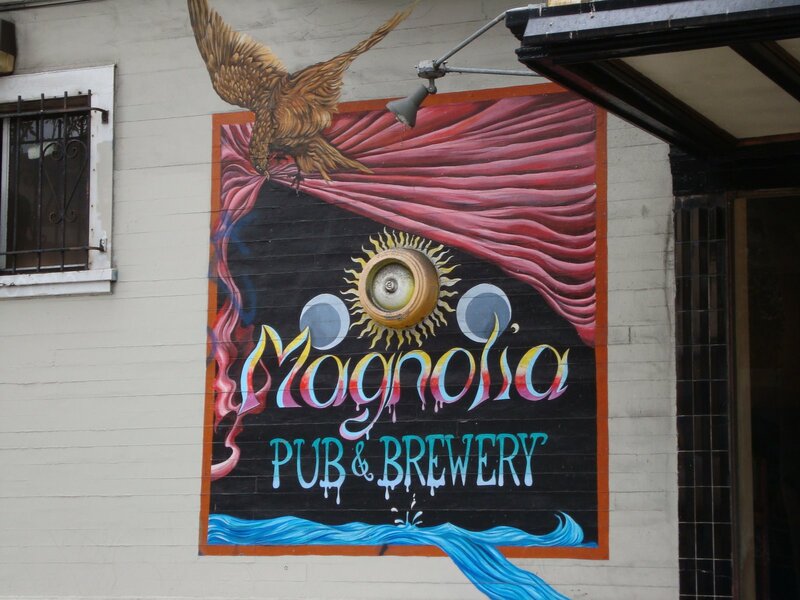 I was there for the beer at Magnolia Pub & Brewery. We walk in and they’re playing what seemed to be a 60’s-era recording of Bob Dylan in concert, a promising sign. We take our seat at one of the large, black booths, and as it is our first time here, order a couple of their tasting flights. The menu looked interesting, but besides a couple of luscious cheese stuffed dates wrapped in bacon, we didn’t order any of the food. Here’s a brief run-down on the notes we took of the beers. One of our favorite beers of the afternoon led off the flight. It’s hazy yellow brew, with a strong peppery flavor and we also noted some notes of lemon. 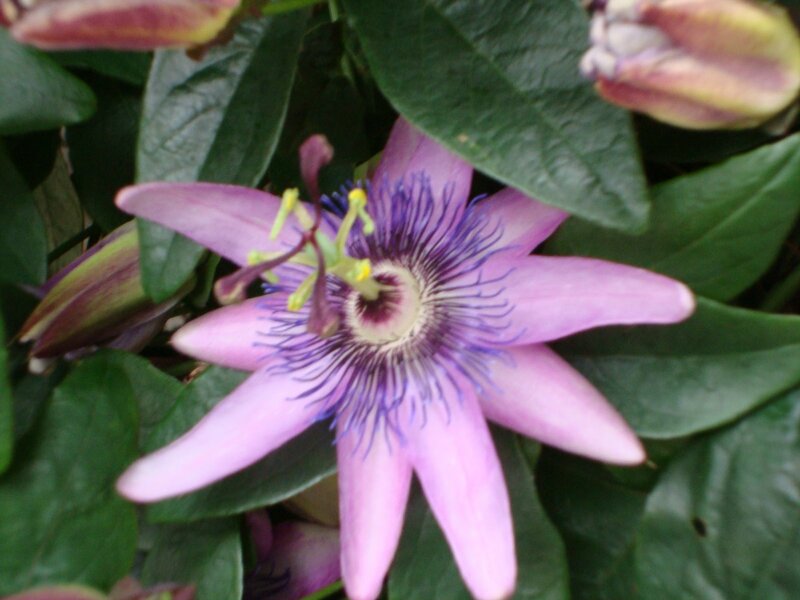 Despite the strong flavors, has a feathery lightness to it. Really nice. Strong, rich bread dough like flavor, without the fruity esters one normally associates with the style. Maybe we picked up a little banana in there, but there was also a little underlying sourness. Still a good beer, but a reminder that California brewers seem to struggle with this style. A toast bomb? Lot’s a toasty malt here, with some nuttiness to the overall flavor. Couldn’t detect much hops here, but with all that toasty goodness, who needs them? This was a more restrained, balance IPA than one usually found in West Coast brewpubs, much more like the East Coast style. Had a citrus-like aroma, a grassy bitterness, and a decent amount of malt to balance the hops. Well crafted and balanced IPA’s like this one are way underrated. We’re back on the West Coast with this one, and in a good way. Lot’s a bitterness, at 100 ibu’s, but there’s more going on than just the brewer punching us in the face with a bunch of hops. We detected some aromatic spice notes and a little sweetness in the malt. Linda’s is a big hop-head, so when we were done with the tasting flight, she had a half-pint of this. 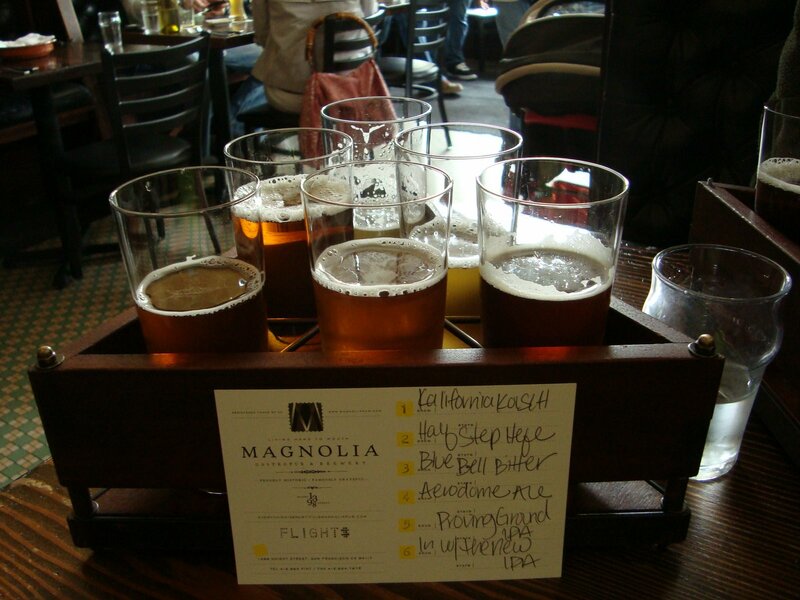 Part of Magnolia’s summer long project to brew various beer styles using artesional Maris Otter malt, in collaboration with Teddy Maufe of Branthill Farms from Norfolk, England. Lot’s of bitter roasted coffee bitterness in this one, with a really sturdy mouth feel to it. Sorry to miss the earlier releases of this project. Afterwards, we walked down the street into the Lower Haight for an early dinner at Memphis Minnie’s barbecue. I like the fact that they don’t use any sauce in the preparation of the meats, but leave a few bottles of traditional barbecue sauce styles at each table for each person to add to their liking. Way too much barbecue is buried in sauce, but Memphis Minnie’s puts their expertly smoked meats front and center. Inspired by San Francisco’s multi-culturalism, Memphis Minnie’s serves sake to pair with their barbecue, which we didn’t try having been a bit beered out by the time we got there. Sure, Memphis Minnie’s is located in barbecue Siberia, but having been to national barbecue shrines Arthur Bryant’s in Kansas City, and Angelo’s in Fort Worth, I assure those dismissing it as “hippie-cue”, it’s the real deal. Linda likes taking photographs of flowers, so this shot taken as we walked back to the car seemed like the appropriate way to end this post. 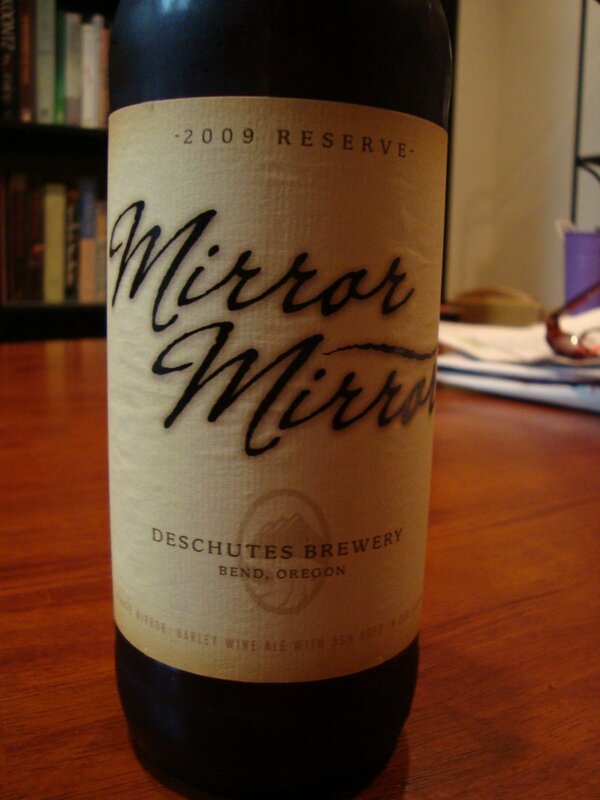 A lot of big, bold runners and beers have come from Oregon. The state has a long, powerful distance running tradition. In the 50’s, University of Oregon coach Bill Bowerman trained Bill Dillenger to set American records in the 50’s, before Dillenger retired from racing and became Bowermen’s assistant, finally taking over as head coach in 1973. Both revolutionized distance running training, and produced numerous All Americans. Such as the brash, iconic Steve Prefontaine who held the American records from the 2,000 meters through 10,000 meters the day he died in a car accident in 1975, at the prime of his running career. And the obsessive Alberto Salazar, a strong 5 and 10 kilometer runner on the track, who moved up to the marathon and in the first marathon he ever ran, the 1980 New York Marathon, defeated a strong field that included Boston Marathon champ Bill Rodgers in his first marathon he ever entered. Salazar went on to a number of New York and Boston marathon victories in the early 80’s, before it is widely believed that his high, 180+ weekly training mileages finally took a toll on his body. Then there’s Phil Knight, who co-founded Nike with Bowerman by selling shoes at Oregon track meets in the early 70’s, and became one of the world’s most powerful businessmen before retiring in 2004. I’ve enjoyed Sidor’s creation a couple times now. Pouring it into my tulip glass creates a foamy light tan head floating on the dark tan brew, with an citrus aroma. It has a rich, creamy malty flavor with an orange-dominated citrus character, and a little pine-like bitterness which becomes more pronounced as it warms. I can taste a little oak from the barrel aging, and at 11% abv, the alcohol is a detectable. It’s complex, yet easy drinking barleywine.